If you’re like many of us, you wait until the last possible second to buy your holiday gifts. Instead of relying on the usual gift cards or a new pair of socks, why not think about a special gift for the disc golfer in your life - a gift that’s meaningful, functional, and affordable. It sounds perfect, right? It's portable: Sure, there are a handful of portable baskets on the market out there, but more often than not they're a pain in the behind to assemble and break down. Not only that, but they can get rather heavy, making it hard to transport between your front yard and the local weekly putting league. With simple set up instructions and a lightweight yet sturdy profile, it's a great basket to take anywhere. It's affordable: It's not uncommon to spend hundreds of dollars on a practice basket, and if you're buying this kind of gift for someone else, that might be a little bit out of your price range. At $159.99, you get a high-quality practice basket that will stand head to head with the best of the best. It's affordable enough to purchase for a junior champion in your life or even to buy a few for various friends. It will help improve your putting skills: This one's a no-brainer, as the Marksman basket is designed specifically to help you hone in your putting so that you're hitting in the heart of the basket each and every time. Its profile is rather small overall, requiring you to dial in your accuracy while building confidence in your stroke. It's built to last: Despite the low price point, this basket is manufactured with the same technology as other full-sized products, meaning it's crafted to stand up to the test of time. The chains are zinc coated and the entire basket is electrophoresed and then powder coated so that it will hold up in any kind of weather. If you think a disc golf basket is an extravagant gift, think again. Anyone who's obsessed with disc golf will thank you for the rest of their life when they see a Marksman under the tree, as it's a gift that will pay off in so many ways. 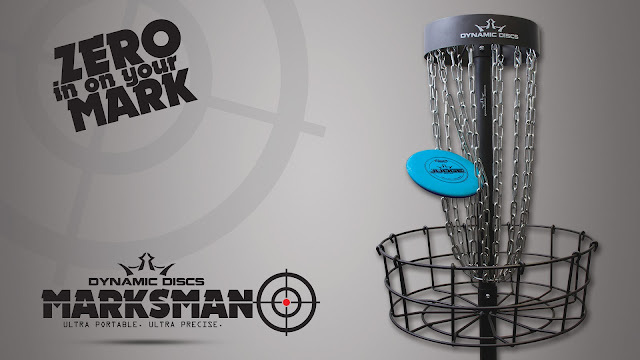 From increasing putting confidence to showing your support for Dynamic Discs, the Marksman basket is the perfect holiday gift for any disc golfer.